Alabama’s Phoenix Missile Works club will be celebrating their second annual Founder’s Day this January 19th and 20th just east of Winterboro, Alabama, about 20 miles south of Interstate 20 and 10 miles south of the infamous city of Talledega. Eleven launches with interesting events are planned for 2008 at the Samson, AL launch site. Our next launch is January 5th 2008 in Samson, AL. The event is Maiden Flight Day. Use a green flight card for any first flight of a rocket and you will have a chance to draw from the prize pool. So this is a chance to get out the exacto and glue and show us something new. In particular, John Hansel will fly the Hewes Space Special for the first time. The Panama City Artist who painted the craft will be there to witness the flight. The SEARS Dec 1st Launch in Samson was a Christmas present in itself! We were blessed with great weather having a high of 69 degrees and winds under 10 mph. Our event was ‘Tis The Season and John Hansel won the event with his Christmas Tree rocket. John Hansel also brought his Hewes Space Special to show. See it fly at the January 5th Launch. 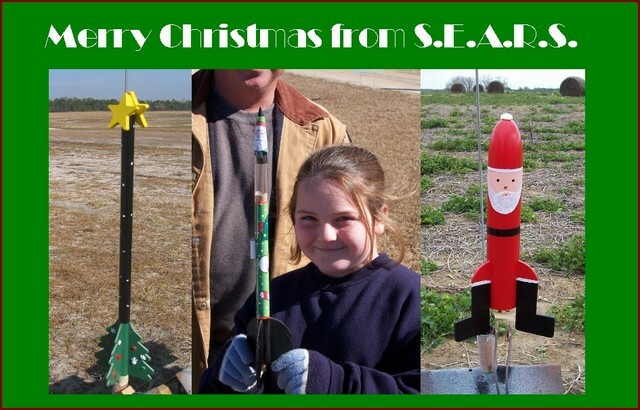 You are currently browsing the SouthEast Alabama Rocketry Society weblog archives for December, 2007.